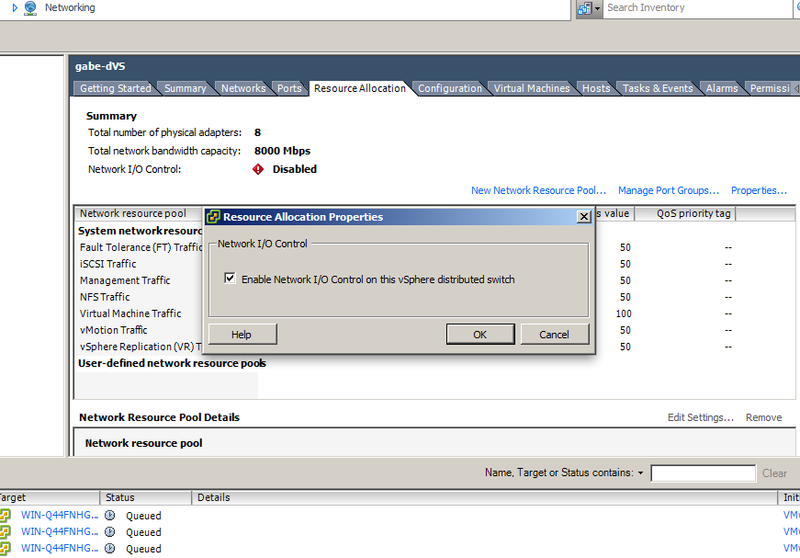 A quick few steps will enable the vSphere Distributed Switch to participate in LLDP conversations. vSphere Web Client > Networking. Drill down and select the DVS. Click Manage. Click the Edit distributed switch settings icon. In the Edit Settings window, Click Advanced. Discovery protocol options are (disabled), CDP and Link Layer Discovery Protocol. Both – My favorite mode. Switch admin sees host details. vSphere admin sees switch details. Everyone has a beer and is happy. In my previous post I mentioned the welcome additions to the esxcli. 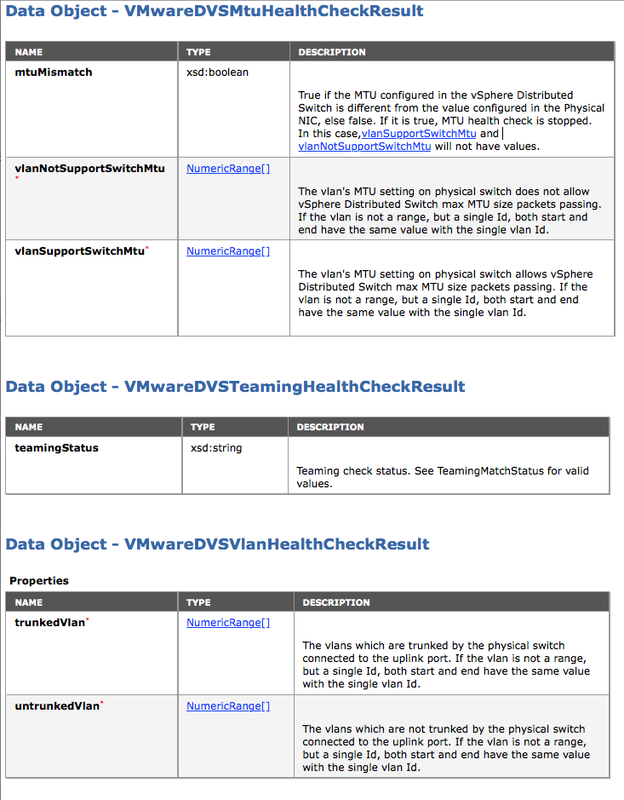 Also very much welcomed are operational improvements to the VDS and to the troubleshooting toolset. 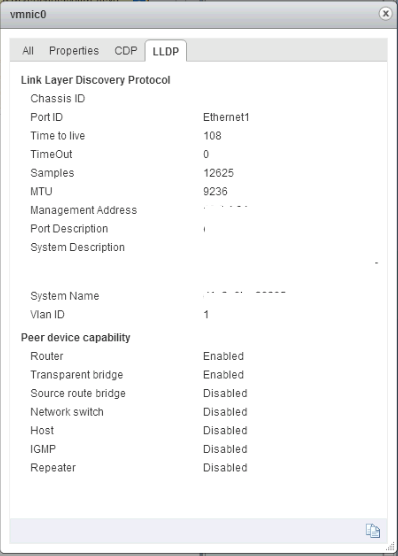 Description : Default alarm to monitor changes in vSphere Distributed Switch vlan trunked status. Description : Default alarm to monitor changes in vSphere Distributed Switch MTU matched status. Description : Default alarm to monitor changes in vSphere Distributed Switch MTU supported status. Description : Default alarm to monitor changes in vSphere Distributed Switch teaming matched status. On that note – I need to throw in the towel and call it a night. Happy learning to any and all. Exciting additions to esxcli with 5.1 plus found an oddity with esxicli maintenanceMode. 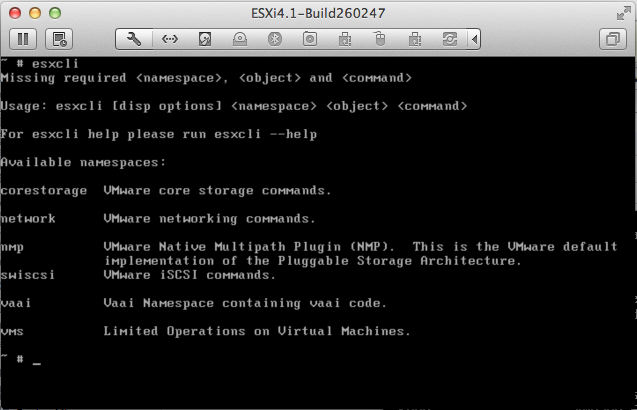 The name space is greatly expanded en esxi5.0 showing true commitment by VMware to its standardization going forward. With the latest update – maintenance mode operations have also been added to esxcli. esxcli system maintenanceMode set -e -t 30 should theoretically set our host into maintenance mode, and sets the timeout to enter maintenance to 30 seconds. Oddly enough it doesn’t work. On that note – I need to go; more command exploration when I come into some free time. 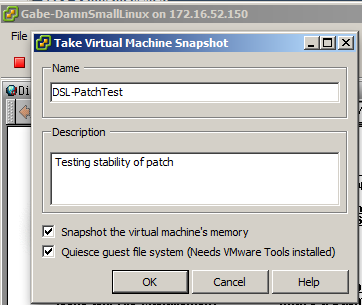 When creating a snapshot from the VM console, you are presented with the option to “Quiesce” the guest file system. That’s it for the configuration, the checkbox you see below. Easy as pie right? But..
◎ Hold up; What does Quiesce actually mean (I have not clue) ? v. i. 1. To be silent, as a letter; to have no sound. To render quiescent, i.e. temporarily inactive or disabled. For example to quiesce a device (such as a digital modem). It is also a system command in MAX TNT software which is used to “Temporarily disable a modem or DS0 channel”. “Quiesce: If the <quiesce> flag is 1 or true, and the virtual machine is powered on when the snapshot is taken, VMware Tools is used to quiesce the file system in the virtual machine. Quiescing a file system is a process of bringing the on-disk data of a physical or virtual computer into a state suitable for backups. This process might include such operations as flushing dirty buffers from the operating systems in-memory cache to disk, or other higher-level application-specific tasks. VMware products require file systems within a guest operating system to be quiesced prior to a snapshot operation for the purposes of backup and data integrity. VMware products which use quiesced snapshots include, but are not limited to, VMware Consolidated Backup and VMware Data Recovery. Virtual machine generating heavy I/O workload may encounter issues when quiescing prior to a snapshot operation. These issues may be related to the component that does the quiescing or the custom quiescing scripts as described in the Virtual Machine Backup Guide. Services which have been known to generate heavy I/O workload include, but are not limited to, Exchange, Active Directory, LDAP, and MS-SQL. The quiescing operation is done by an optional VMware Tools component called the SYNC driver. As of ESX 3.5 Update 2, quiescing is also done by Microsoft’s Volume Shadow Copy Service (VSS). VSS is provided by Microsoft in their operating systems as of Windows Server 2003 and Windows XP. Operating systems which do not have the Volume Shadow Copy Service make use of the SYNC driver for quiescing operations. A guest operating system may appear to be unresponsive when there is a conflict between the SYNC driver and services generating heavy I/O. If installed, the SYNC driver holds incoming I/O writes while it flushes all dirty data to a disk, thus making file systems consistent. Under heavy loads, the delay in I/O can become too long, which affects many time-sensitive applications, including the services which generate the heavy I/O (such as an Exchange Server). If writes issued by these services get delayed for too long, the service may stop and issues error messages. To avoid this issue, disable the SYNC driver or stop the service generating heavy I/O before taking a snapshot. Note: The sync driver is only required for legacy versions of Windows such as Windows XP and Windows 2000 which do not include the Microsoft VSS service. Updated versions of VMware Tools will automatically uninstall the SYNC driver. Disabling the SYNC driver allows you to keep the heavy I/O services on-line, but results in snapshots being only crash-consistent. In Device Manager, click View > Show hidden devices. Right-click Sync Driver and click Disable. Click Yes twice to disable the device and restart the computer. Use the following pre-freeze and post-thaw scripts to take the service generating heavy I/O offline for approximately 60 seconds and then restart it again after the snapshot is taken. This approach leaves the service inactive, but keeps the SYNC driver enabled while the snapshot is taken, ensuring application consistency. Using this method, you create the quiesced snapshot of guest operating system. And that’s all the time I have right now – I hope this has been informative. Cliff notes for NetIOC. 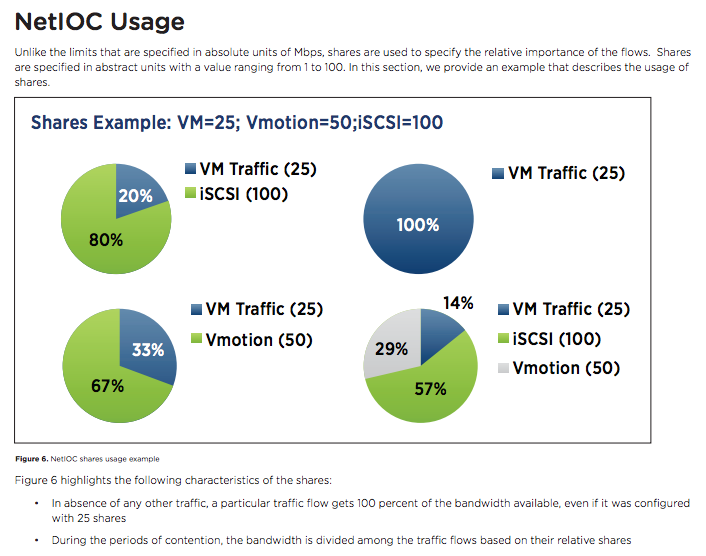 You can find a most excellent white paper describing this feature in 25 glorious pages here: VMware Network I/O Control, Architecture, Performance and Best Practices. NetIOC is only supported with the vNetwork Distributed Switch (vDS). resource pool won’t be dropped due to high utilization by other flows. resource pool will never exceed a given limit for a vDS out of a given vSphere host. Group’s team. Note that LBT does not use shares or limits to make its judgment while rebinding ports from one dvUplink to another. 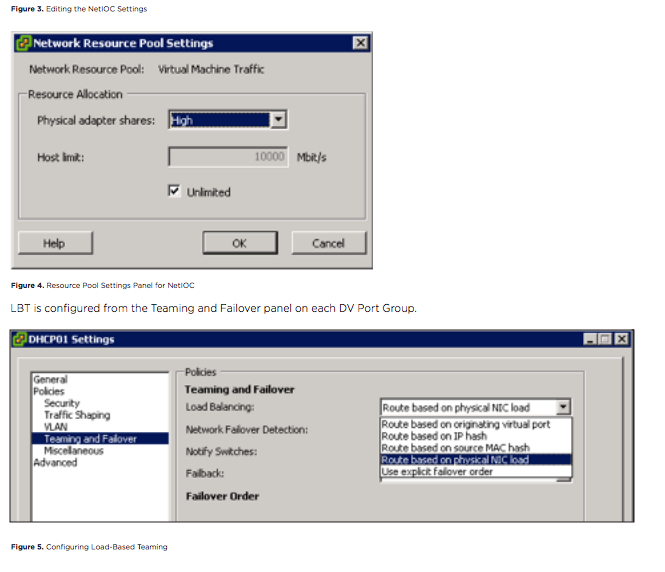 LBT is not the default teaming policy in a DV Port Group so it is up to the user to configure it as the active policy. period. LBT will not move flows more often than every 30 seconds. NetIOC is configured through the vSphere Client in the Resource Allocation tab of the vDS from within the “Home->Inventory->Networking” panel. vDS” in the pop up box. That’s all folks. I’m out.